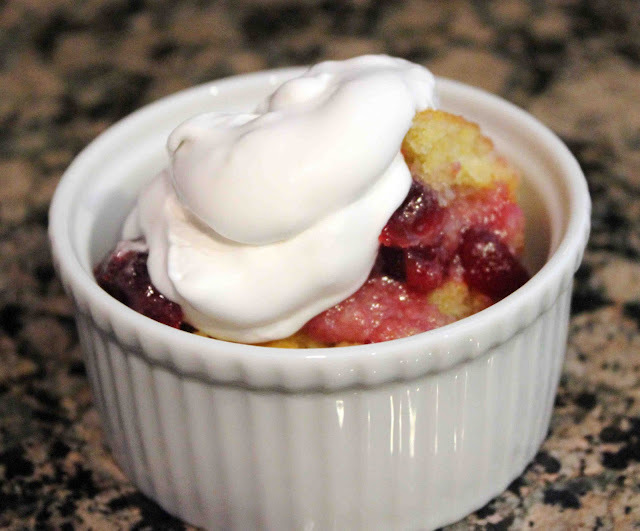 This is a wonderful cranberry dessert that is perfect any time of of the year, especially during the holidays. I don’t remember when we actually made this dessert for the first time, but I do remember the little “catastrophe” that followed…. The cranberry dessert slipped from Matt’s hands, and fell to it’s final destination, the concrete driveway, producing broken casserole dish pieces galore. Okay, I may be exaggerating a little, but we were certainly not going to eat the leftovers in fear that we might swallow some broken glass! Disappointed as we were, I guess we saved ourselves some calories that night, and the next few days as well! For Christmas this year, we thought we’d whip up this lovely dessert once again. This time, there was no clumsiness and I fully enjoyed leftover cranberry-maple pudding cake for the next week. 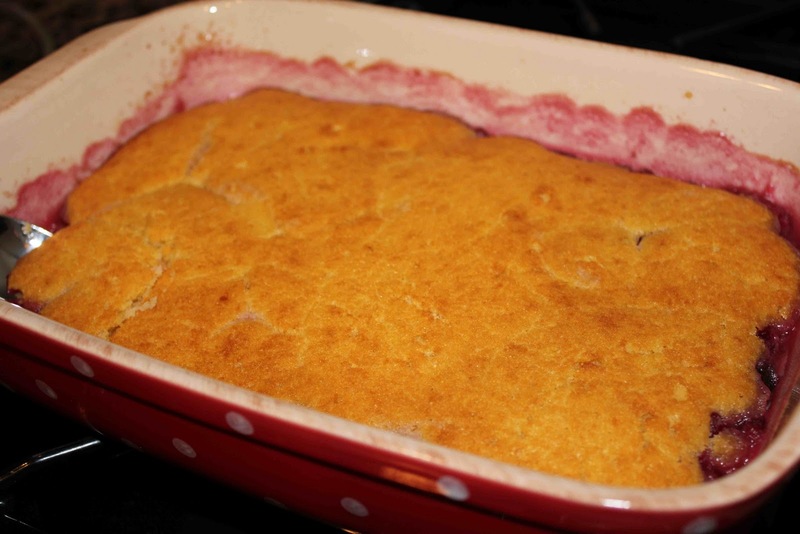 As far as taste, this dessert is sure to please those that like cooked fruit (not my dad). 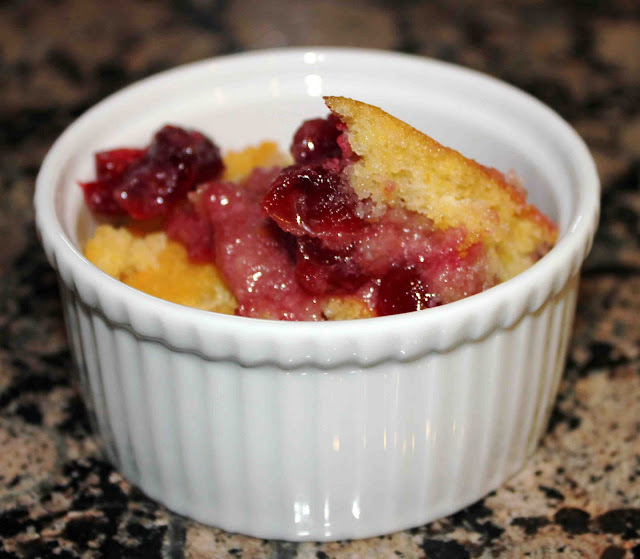 The maple syrup calms down the tart cranberries and creates a slightly sweet and delectable flavor. I am reminded of a cobbler with a sweet cornbread taste, juicy fruit, and an interestingly irresistible texture. Top it with a simple squirt of Reddi-wip, a dollop Cool Whip, or my favorite… a scoop of vanilla ice-cream, and you’ve got yourself a crowd pleaser. 1. Position rack in center of oven and preheat to 400 degrees F. Combine first 4 ingredients and a pinch of salt in medium saucepan. Bring to a boil, stirring occasionally. Reduce heat and simmer 1 minute. Remove from heat. 2. Whisk flour, cornmeal, baking powder, and 1/2 tsp. salt in medium bowl. 3. Whisk egg and sugar in another medium bowl. Whisk milk, melted butter, and vanilla into egg mixture. Add flour mixture to egg mixture; whisk to blend. 4. Pour warm cranberry mixture into 11 x 7 x 2-inch or 8 x 8-inch glass or ceramic baking dish. Pour batter over. 5. Bake cake until golden and cranberry mixture bubbles at edges, about 28 minutes. Cool 15 minutes. Serve cake warm topped with creme fraiche whipped cream, or vanilla ice cream.